SANFORD — The search for Michelle Parker and clues to her disappearance has resumed this morning from a volunteer command post in Sanford. Good morning Tupelo and monkey guests. How ironic that Tyler Watters was booked into the OCJ on November 17, 2011 at 9:20 am for selling Oxy. Tyler Watters - the same guy Chris George was last seen with, Tyler Watters the same guy that used to hang with James Hataway, Tyler Watters the same guy whose name just happened to pop up in relation to Tracy Ocasio's disappearance, Tyler Watters that lives in Ocoee not far from where Michelle disappeared from, Tyler Watters the guy that's known to hang out at Cowboy's among other bars in the area...hmmm... I just thought it was ironic so thought I'd mention it. I also think it's ironic that he has that tatt of the cross on his neck, Chris George's jewelry consisted of a similar cross, just like Michelle's jewel encrusted pendant - all similar in design. Michelle's vehicle parked with no trace of her, parked in the same manner as Jennifer Kesse's car. Michelle's purse left in her H3. Michelle's keys and cell were missing - now the cell has been found. Hataway used to go by the name Vader - as in Darth Vader. I wonder if some of these same cats used to hang together...or still do. Anyway, I just thought the timing was coincidental & interesting so thought I'd mention it. I wanted to add as a side note that just bc he was booked on the 17th, it doesn;t mean it was the initial date of the original arrest. Also, the weekend before Michelle disappeared, a new search for Tracy Ocasio took place by Search and Rescue of Central Florida. Could it have ticked someone and their group off so they struck again? Joe Ocasio said a team from Search and Rescue of Central Florida spent the weekend combing several areas in west Orange County. Those areas are the same ones teams searched about a year ago for the missing Ocoee woman. The latest search did not turn up anything, but Tracy's father said after getting some new tips in the case, more new searches are planned in the coming weeks. Am a little disappointed that there is so little news today. Have to hold onto hope that LE has a lot of evidence they are not releasing and that they will get clues from her cell phone data that will help find her. I agree with you. I've found nothing really new today, except a post on her "Missing" FB page saying they need to search near Exit 22 or something. Remember Lake Vaj being brought up in Casey's case? Where is it located again? I swear I forget. Was it the nickname of the person's house, something derived from female anatomy? It wasn't slang for a real lake from what I remember, but lewd in nature. 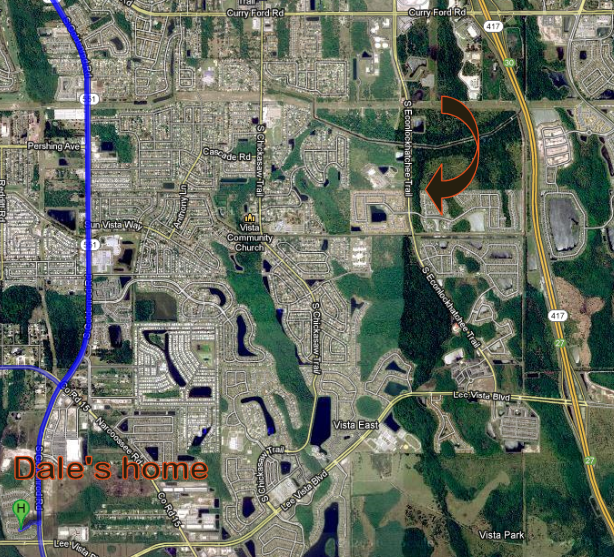 looks like exit 22 is a straight shot from Dale's according to what I just read online. I'll have to use google map. Looks like that is a suggestion from a poster. Not sure it holds any merit. LE did an ATV search last week near SR417. No idea where exit 22 is though. WOW Titch. That is ironic about Tyler Watters!!! Remember when I posted his info on the family's FB page, and then it was removed?! Maybe it was passed on to LE. Or, he has never been out of LE's radar and they found a way to arrest him. (Which is more likely the case) At least he is off the streets.....for now. FYI....In the state of Florida, if you possess 5 or more pills of a controlled substance without a prescription, you get charged with trafficking. It's how the State is trying to combat the prescription pill epidemic. The family and friends of missing mother Michelle Parker plan to resume their efforts to find her in Kissimmee Thursday. Volunteers are being sought to help to post missing person fliers around Osceola County, said Parker's friend Angela Mann, who has been organizing search efforts since last month. Friends will gather at 1 p.m. at Alligator Alley in Kissimmee, 4710 West Irlo Bronson Memorial Hwy, to begin distributing the fliers. No foot searches will be performed Thursday, Mann said. A benefit for Parker's children will be held at the same location starting at 6 p.m. with a performance by country singer Josh Thompson, Mann said. Yeah, I've been saying since the beginning that there's so many similarities, but then again I'm like a horse with blinders on and that's not good sometimes. There might not be any kind of connection at all, but it is interesting when the similarities between these cases are considered. I can't help but wonder if the scenario of disposal is a copycat thing ... or ... id some of these same players (or their group) know somebody in Michelle's circle. I can't get away from the bars...it's what keeps me coming back to the previous disappearances...most especially George & Ocasio. Chances are there's no correlation...but what if? Thanks for the directions to exit 22 Tupelo. Where was the truck siting coming out of the woods again? Was it by the airport? For some reason I thought the siting was off of 528? LE searched an area of State Rd 520 following up on a tip from a trucker, saying he saw a man that looked like Dale with a truck like Dale's coming out of the woods, looking suspicious. Something else, I'd like to know if le subpoenaed area business for their surveillance tapes from Nov 17th. It hasn;t been released yet if they have. If le did obtain footage of somebody dropping Michelle's H3 off at Walden Palms, then surely they'd release the person's description if it was determined not to be Michelle. Afterall, they waited forever to release the suspect parking Jennifer Kesse's car but if they'd have released it closer to when she disappeared then maybe that description would still be etched in someone's memory...instead it's lost now. If they have footage of Michelle, then they have footage of Dale. If he were driving separately, they'd have him behind the wheel of his truck. Which brings me to this: We're wondering why somebody would throw Michelle's cell over the bridge. Well what about if the perp was in the vehicle, caught Michelle attempting to dial 911, got mad grabbed it & tossed it out the window into the water thinking it would kill the phone for good? Or, maybe the phone was lost in a vehicle (be it Michelle's or someone else's), then discovered and panic set in so they subsequently grabbed the phone & threw it in the water? Either way, it last pinged very close to where it was found. Brandi, I am so thankful for you. Seriously. It's almost as if your memory is relative to a flashdrive. The bars may very well be KEY in the disappearances of JK, TO, and now MP. Someone that was told off by these women, or they blew him off, or some stupid reason that sets this person off. (Kind of sounds like someone with anger issues.....hmmmmm) I'm not discounting this, at all. Anything is possible. Page created in 6.27 seconds with 20 queries.